Gibson L-5 Model Arch Top Acoustic Guitar (1931), made in Kalamazoo, Michigan, serial # 88439, Cremona Brown Sunburst finish, curly maple back and sides, spruce top; maple neck with ebony fingerboard, original black hard shell case. 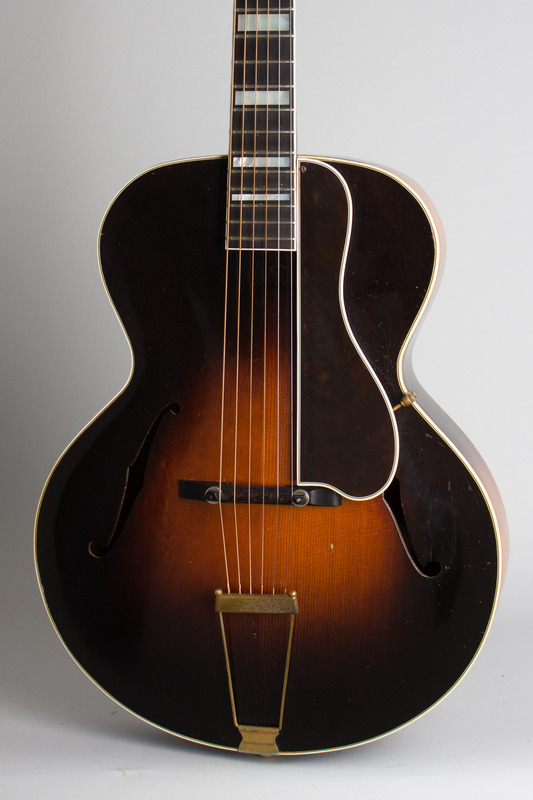 This late 1931 L-5 is a beautiful example of the pre-eminent orchestra guitar of its era -- the original f-hole archtop guitar -- and an extremely fine sounding instrument. Debuting in 1923-4, the L-5 was the first modern archtop; at the time this one was built, nearly ten years later, it was still the top of Gibson's line and universally considered the finest carved top guitar made. Orchestra and jazz band banjoists were by this time almost universally converting to guitar; the $275.00 L-5 along with Epiphone's competing Deluxe -- launched in mid 1931 -- were the choice of nearly all top professional guitar players of the time. Eddie Lang, the era's most influential guitarist, went from a Gibson L-4 to a dot-neck (probably 1927) L-5, then to an early block neck L-5 (practically identical to this one) around 1930, setting the trend for all to follow. 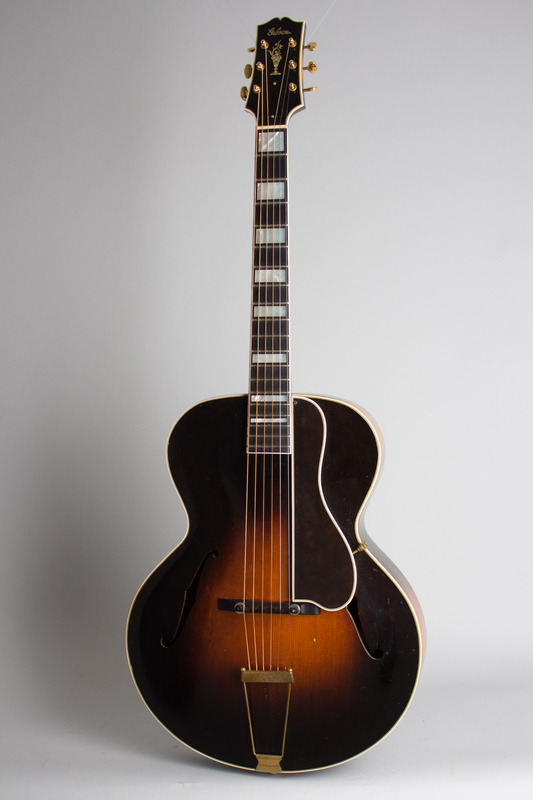 In 1931, when this one was shipped, the L-5 ruled the roost for orchestra guitars, and gave Gibson a dominance in this style of instrument that the company never lost. That said, these early L-5s are fairly rare guitars today. Retailing at $275.00 (plus case! ), the L-5 was extremely expensive (a top-of-the-line Martin pearl-trimmed Style 0M-45 retailed exactly $100.00 less). In 1931-2 at the height of the Depression only top professional users with steady salaries could afford the indulgence of such an instrument. 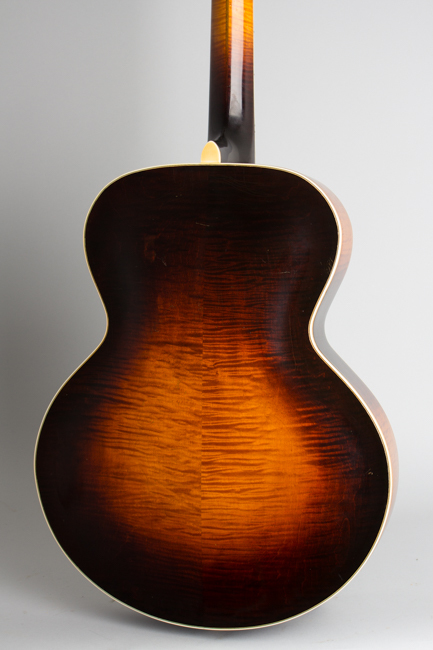 Most early 16" L-5s were used extensively for many years, some owners continuing to prefer them to any later guitars. They are still often seen in the hands of recording studio players well into the 1960s. As working guitars, these instruments have often been heavily modified, refitted, or refinished. This one is far better preserved than most; it has had some minor work, but remains a superb instrument in far better condition than most retaining all of its original character. 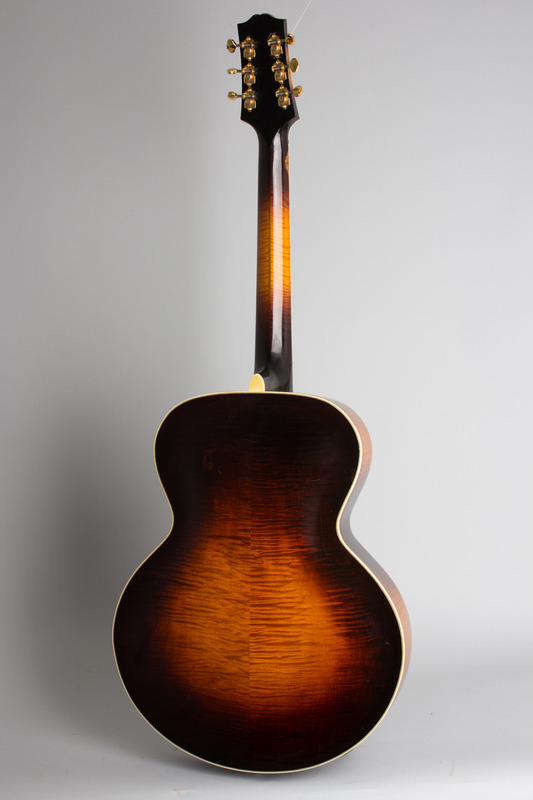 This guitar shows typical features for an early 1930s L-5; the transition between variants of this model is particularly inexact and the serial numbers are vastly out of order from the progression of features. 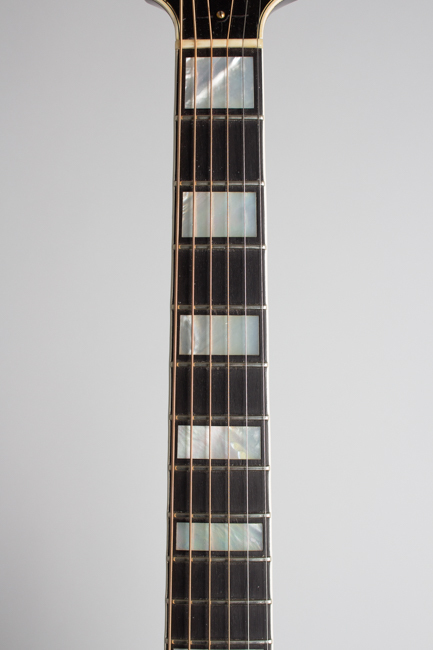 This example shows the then-new genuine block pearl inlay in the side-line bound, straight-end ebony fingerboard in place of the dots used on the earlier versions. The 3-piece laminated curly maple neck has a noticeable "V" spine with a relatively shallow profile, but still thicker than some later models. 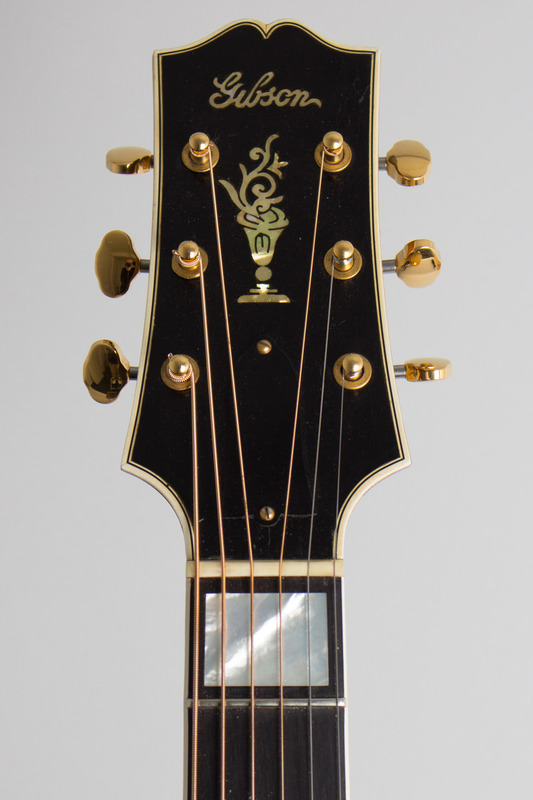 The pearl inlaid flowerpot in the triple-bound headstock and straight across "The Gibson" logo are the hallmarks of the 1930-33 L-5, as are the then-new Grover G-98 tuners with riveted gears and metal "butterbean" buttons-replaced with drop-in reproductions on this instrument. The body on this particular guitar is slightly larger than many early L-5s at 16 3/16 inches wide, and is triple-bound back and front. The long triple-bound celluloid pickguard is screwed to the top by the neck block instead of pinned to the side of the fingerboard, another recently introduced feature in 1930. The top, back, and sides carry a beautifully blended dark sunburst finish; the back and sides are superb extremely tight-grained curly maple. The tailpiece has the earlier "string over" crossbar, but attached in the "strung through" manner -- this appears to be original, or at least the way it has been for a very long time. The adjustable ebony bridge is a recent replica replacement. This particular guitar is extremely well-preserved; one of the finest from this era we have ever had. The braces on this instrument are the original solid carved design, not the "kerfed" bracing (partially cut through to make it quicker and easier to fit) that began to appear on L-5s around this time. This is generally held to be a sonic plus -- certainly this guitar has a powerful and very versatile sound typical of the best early L-5s; simultaneously warm and incisive with plenty of depth. 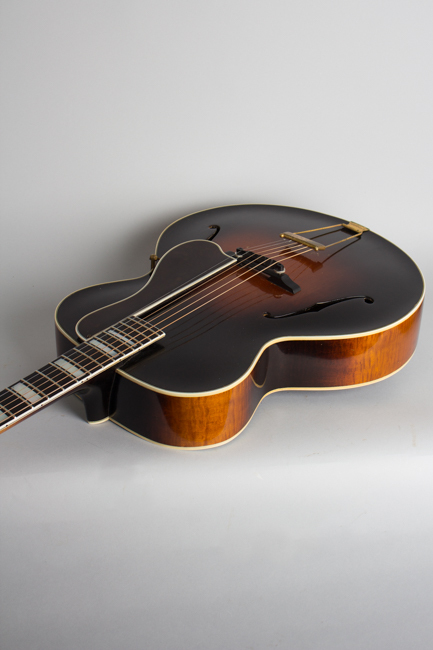 It plays extremely well and is extremely responsive for an archtop guitar...it even sounds lovely fingerstyle! This is a wonderful example of one of our all-time favorite instruments. Overall length is 40 3/4 in. (103.5 cm. ), 16 3/16 in. (41.1 cm.) wide at lower bout, and 3 1/4 in. (8.3 cm.) in depth, measured at side of rim. Scale length is 24 3/4 in. (629 mm.). Width of nut is 1 11/16 in. (43 mm.). This is a very clean and well preserved guitar, one of the best preserved we have seen with some typical hardware changes but far less wear than most of these early L-5's. The finish has light checking and some small dings and dents but no large areas of wear. There is one tiny grain crack to the top off the edge of the treble side F hole. The guitar has been refretted nicely, with wire a bit wider than the original but not obnoxiously so. 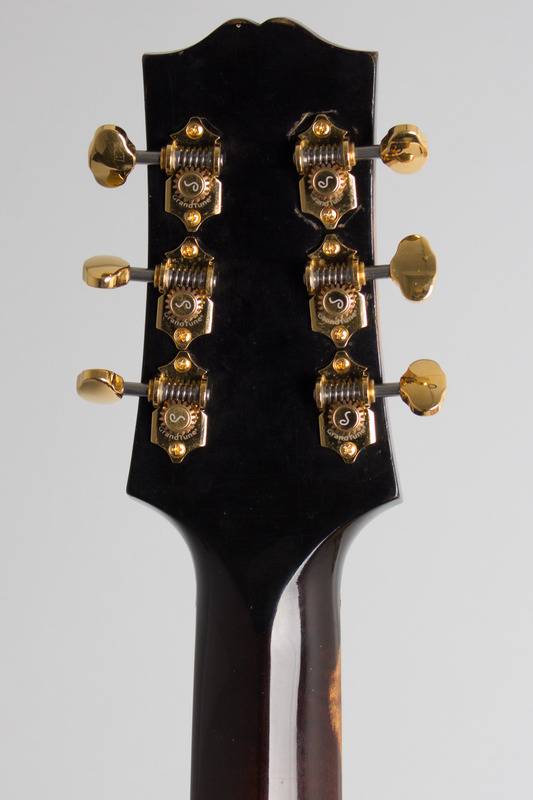 The tuners and bridge are modern replicas in the correct style. This is a great playing and sounding guitar showing far less wear than most, with a deep and even sound that had a lot more warmth than most arch tops, even similar L-5's. Includes the original HSC in nicely preserved shape with some external wear and a new handle. Overall Excellent Condition.